This goes great on chocolate brownies or any chocolate cake. This is a very easy frosting to make, it requires no cooking, and if you have a mixer you can make a frosting that everyone will enjoy. 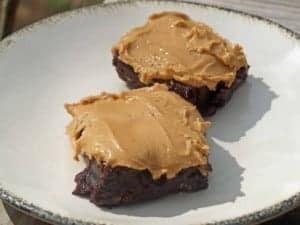 Peanut butter frosting is perfect for brownies or chocolate cake. Combine peanut butter and butter in a bowl, and mix with a mixer until smooth. Add powdered sugar and vanilla extract. You will need to refrigerate this for at least 1 hour before serving. This is actually really good! I used it for a cake I made for my parents wedding anniversary! My Dad loved it!